With the final between Chennai Super Kings and Mumbai Indians having been played out at Eden Gardens on 24th May, another season of the Indian Premier League has come to an end. Apart from the occasional controversies and corruption cases, the tournament has had quite a successful run, by most commercial measures over the last eight years, especially considering the novelty of the concept to cricket as well as to India. 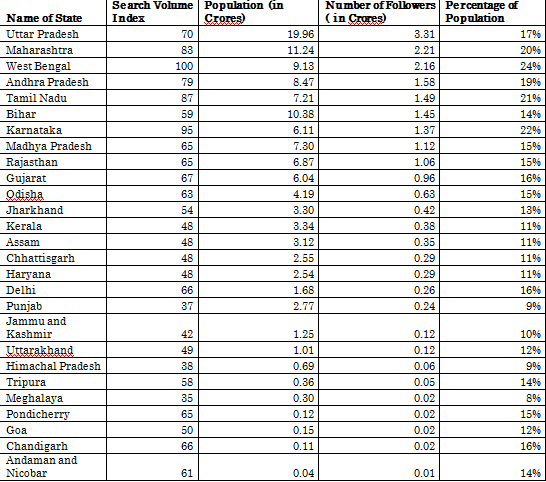 But what exactly is the size of the IPL market in India and how is it distributed among the various states and regions? In 2011, Nate Silver came up with a methodology to estimate the geographic appeal and market size of each college football team in USA using data from Google trends. Later, he used the same to estimate the fan following in media market of each National Hockey League. We can use the same method, in slightly altered fashion, to get some idea about the market of Indian Premier League. This graph represents how the number of Google searches for all Indian Premier League related terms, as percentage of the overall number of Google searches on a per capita basis, has moved over the years. The data is normalized in a way that the highest point in the graph is always 100. Some of the states/UTs, especially the smaller ones, have not been represented on the table as the search volume in those states is too less to be recorded by Google. 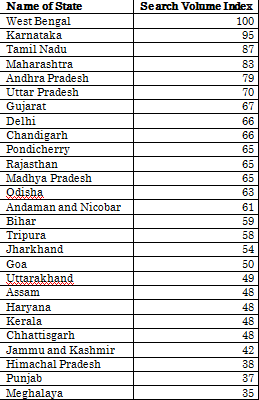 As you can imagine, this table gives us an idea about the percentage of Indian Premier League related searches carried out by the people of each state. For example, if 1% of the total Google searches by an average user of West Bengal are related to the IPL, 0.95% of the Google searches by an average user of Karnataka are related to the IPL and 0.48% of the Google searches by an average user of Chhattisgarh are related to the same. Thus, this number can be taken as a proxy for the relative following of IPL among the different states. But how do we estimate the total number of IPL followers in India? Though there is no concrete number available, media reports indicate that the number of unique television viewers for this season of Indian Premier League stands at around 20 Crores. Now a lot of people may have just viewed an IPL match in passing, whereas a number of devoted followers of the tournament may not have a television at home. But, overall, it looks reasonable to estimate the number of IPL followers in India to be somewhere around 20 Crores, or around 15.5% of the total population. Uttar Pradesh, mostly on account of the sheer size of its population has the highest number of IPL followers, followed by Maharashtra at a distant second. However, Uttar Pradesh is also one of the poorest states in India and as a result, it may not be as lucrative a market as the table above suggests. 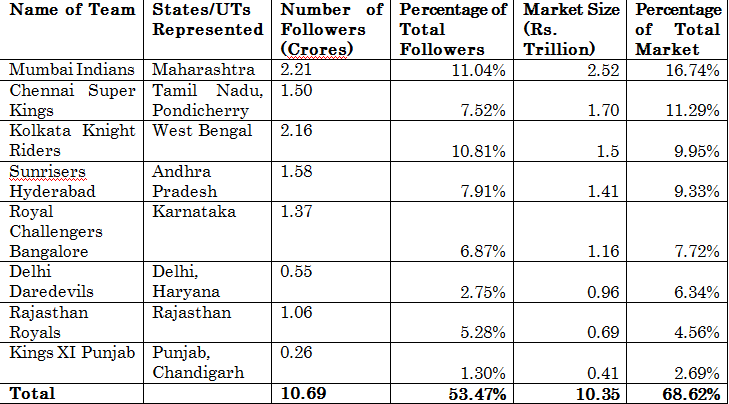 Considering this, in the following table, the number of IPL followers has been multiplied by the per capita income of each state and union territories to arrive at the relative market size of each state. Maharashtra has the largest share of the market in terms of actual rupee value. Six of the top eight largest markets are currently being represented in the form of existing IPL teams, the notable omissions being Uttar Pradesh and Gujarat. 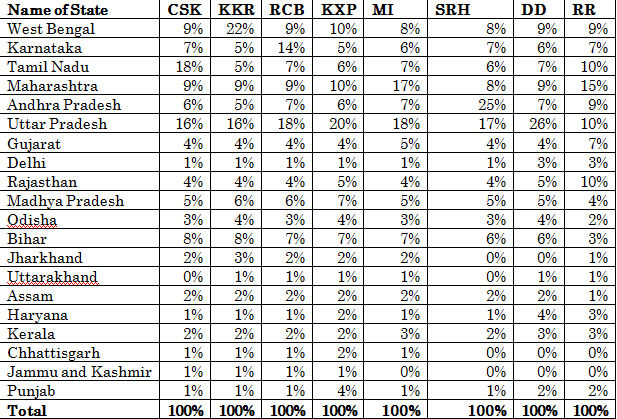 Here is the market share of the existing IPL teams in terms of both number of followers and market size. The eight existing teams cover almost 69% of the existing IPL market in India, which may be considered more or less acceptable. However, some of the teams have very low base market. Kings XI Punjab in particular ranks last both in terms of both number of IPL followers as well as the rupee market size. Even if we add the markets of Himachal Pradesh and Jammu and Kashmir to the markets of Punjab and Chandigarh, its standings would not improve much. For that matter, even the market of Kerala (which was represented by Kochi Tuskers Kerala for one season) does not appear a very lucrative one with a market share of just 2.42%. So, where can the IPL expand next? In terms of sheer volume, Uttar Pradesh is the most obvious answer. It has a population which is more than 15% of India’s population. Also, the interest for IPL is strong there, in spite of it currently not being represented by any IPL team. However, Uttar Pradesh is also desperately poor with per capita income among the lowest in India. And for any IPL franchise to succeed financially, it has to be based out a city which shall ensure consistently high gate receipts. Uttar Pradesh currently has only one international stadium, the Green Park located in Kanpur, and as a result, the UP based franchise will have to operate out of Kanpur. Kanpur, however, does not feature among the top 15 cities in India in terms of GDP (Lucknow does, but it does not have an international stadium yet). Kanpur also ranks only 11th in terms of population among the urban agglomerations. On the other hand, it is difficult to explain Gujarat not having an IPL franchise. Although the potential market of Gujarat is slightly less than that of Uttar Pradesh, it is still higher than that of Rajasthan, Delhi-Haryana combined, Punjab or Kerala. It has as many as three international stadiums (located at Ahmedabad, Rajkot and Vadodara) managed by three different state cricket associations. It also has a fourth one in Surat ready and waiting for approval. Also, Ahmedabad and Surat feature in the list of top 15 cities in India in terms of GDP as well as in population, ranked at #7 and #9 respectively in both the lists, with all the top 6 cities currently being represented by an IPL franchise. Pune, ranked at 8th, also had a temporary franchise before it was disbanded. In fact, Indian Cricket League (ICL), the precursor to IPL, had a franchise based out of Ahmedabad, called the Ahmedabad Rockets. Gujarat also has a thriving business class, who should have been willing to invest in a home based franchise. That it did not is perplexing. We may look at the amount shelled out in the form of investment for buying these particular franchisees and compare the same to the base market size of these franchisees. Kings XI Punjab was the most over-valued franchise, significantly deviating from the mean fee forked out for every rupee of base market available, whereas the owners of Mumbai Indians, Kolkata Knight Riders and Chennai Super Kings got more than the average bang for their bucks. The remaining franchise fees were clustered around the average values. However, our analysis till now assumes that only the teams get their followings from the base markets only. In reality though, considering the mass level of migration, especially in the big metros of the country, as well as the star power of celebrity owners and big name players, franchise affiliation is expected to cut across regions, some more so than others. One way to find out the relative size of fan base of various teams is again to compare the average value of search index related to the names of each IPL franchise over a period of time. For example, if the average search index value for ‘Chennai Super Kings’ related terms is 100 and that for ‘Kolkata Knight Riders’ related terms is 90 over a period of time, it probably means that Kolkata Knight Riders had 90% of the market share being enjoyed by Chennai Super Kings over that period of time. Selecting the time period is a matter of contention in this case. Should we select the entire time period dating back to the beginning of the first season of the IPL and average it out? The problem with this approach is that it takes in a lot of very old values, specially the values belonging to the initial years when some of the teams were not so successful or probably had not invested much in branding and marketing. Plus, more importantly, it does not capture the market value of Sunrisers Hyderabad which came into existence only three years ago. Another method is to look at the average over the last one year. But then, we also include the period of the Chempions League T20 when the searches related to the teams which have qualified show a spike, whereas those which have not largely remain stable. For the purpose of this article, we have averaged the search index results for each team for the period between April and June (i.e. when IPL is held) over the last three years. (For this year, we have only considered data till 24th May, 2015 i.e. the date of the IPL final). This ensures that only the IPL related searches are taken into consideration (and not off-season corruption related ones like in case of certain teams), all the seasons of Sunrisers Hyderabad are considered and old values are discarded as well as single season aberrations are not given disproportionate value. This may not be such a robust calculation as far as exact market shares are concerned. But it does help us get some idea about the relative popularity of various IPL franchises. And the answer is not very surprising. CSK, the most successful IPL team in the history of the tournament, has as much as one-fourth of the total market size. The top four teams (i.e. 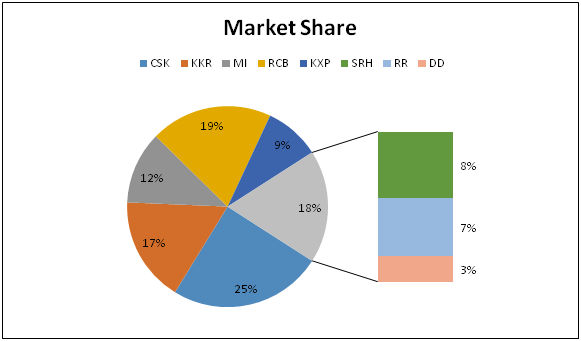 CSK, RCB, KKR and MI) end up getting around ¾ of the total market share among themselves. For validation of the results obtained here, we may also look at the relative number of followers of the respective teams in social media platforms like facebook and twitter. Here also the numbers more or less represent the same picture. Chennai Super Kings leads the table in google searches and twitter as well as on an average, narrowly missing out on facebook. There is close contest for the next three places with very little to separate between KKR, RCB and MI; however, KKR finishes second on an average thanks to its superior facebook presence, while RCB slightly edges out MI for the third position. There is no dispute though, for the last four positions, with Delhi Daredevils ending up with the wooden spoon in all the three platforms. The top four teams (let us call them the ‘Big Four’) have a number of things in common. First of all, they have had pretty successful IPL runs. In fact, together, they have won the tournament six out of eight times. 13 out of the 16 possible finalists in the eight IPL tournaments come from this group of teams. They have also big base markets available to draw their fan following from. They have big brand, extremely recognizable star cricketers or owners, representing them from the beginning of the IPL (Mahinder Singh Dhoni for CSK, Shahrukh Khan for KKR, Virat Kohli for RCB and Sachin Tendulkar for MI). They have also formed a core of at least 4-5 successful players, available to the teams at least for the last 5 seasons, thus providing a sense of consistency for the brands. Among the four teams with less following, SRH is the new kid on the block and is only three years old. Although it has one of the largest markets available to itself, it desperately needs to start performing well to attract a sizeable fan following. Among the other teams, most have been inconsistent in their performances, guilty of chopping and changing players all too frequently and often, do not have the star power to attract a loyal, sizeable fan following. They also do not have very large base markets available; as a result, they cannot afford to err on so many fronts. Interestingly, Uttar Pradesh serves as the largest market, in terms of number of followers, for four different IPL teams, underlining the vastness of its market. Some of the states have not been represented in the table as full data for them is not available. Again, here also, do not by the absolute percentage figures. This just gives a rough idea of relative standings. 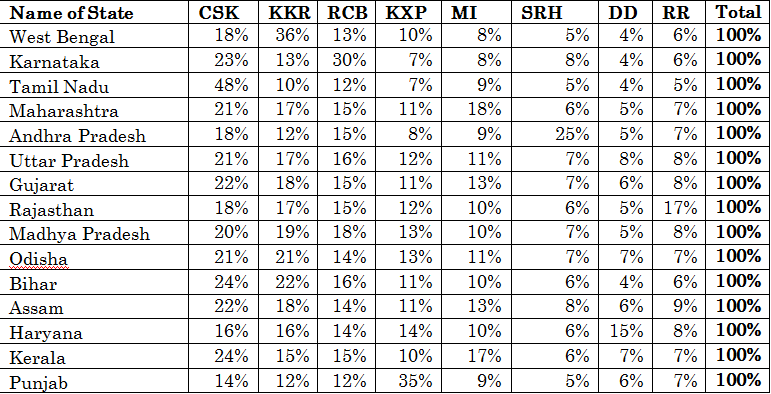 CSK does well broadly across all the states, besides having a close to 50% share in Tamil Nadu. All the teams are the most followed ones in their respective base markets, apart from Mumbai Indians and Rajasthan Royals, which narrowly lose out to CSK in Maharashtra and Rajasthan, respectively. 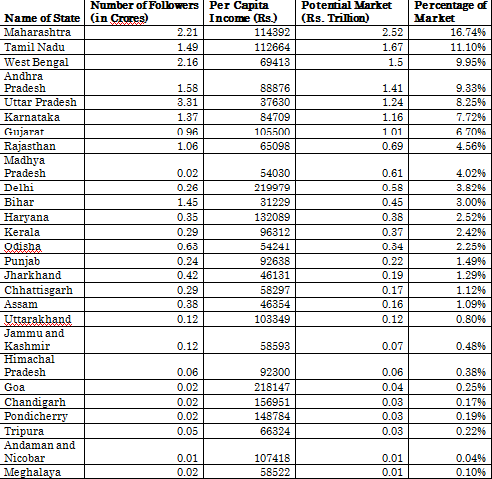 Although the data for Delhi is not available, DD has only average market share in neighbouring Haryana and Uttar Pradesh. Similarly, in spite of choosing Gujarat as a second home state, RR languishes there. India ends up having around 86% of the total IPL fan followers. Bangladesh and Pakistan are the two other countries having relatively large IPL following. Outside the continent, only the countries of the Caribbean (counted as a whole) and the USA make it to the top seven. Other than these seven countries mentioned in this table, all others have number of IPL followers of less than a million.